The Judge – 3.5/5 – There is something to be said about this time of year; everyone is trying to be ‘that’ film to win the Oscars. For any film fanatic, they know to expect the best films in this part of the calendar year. With this being said, three major things start to pop up in these films: Big name actors, deep stories and riveting performances. Even so, you can still get films that just don’t quiet mark the benchmark. This is one of those films. Staring big actors Robert Downey Jr. and Robert Duvall; the Judge is a film with some really great performances, but because of some story choices, it never becomes a completely great film. Premise: An estrange Son comes home under dire circumstances. When his father is implicated on murder charges, the son and father must find enough strength and wisdom to save not only themselves, but each other. Hank Palmer is the son of Joseph Palmer. From their first confrontation in the film, these two characters have strong friction; one that builds up throughout. When it comes time for the son to defend his father from murder charges, it throws an already fragile relationship into a deeper tailspin. The two actors do a great job in creating a deeply fragmented ‘father/son’ relationship. In that relationship, they both portray what it is like having two staunch personalities under one roof. They are both headstrong, valiant in their beliefs and only want what is going to be a ‘successful’ outcome of any given situation. What is very ironic is how their contrasting in views, but both loves each other for those views. That strong aura of compassion from afar is what makes it all feel real on screen. Robert Downey Jr. is nothing short of amazing; and even when he does borderline in showing the ‘Tony Stark’ isms, he holds back enough to bring a different kind of character. It is one that is arrogant, witty but loving. Duvall is an acclaimed actor who brings across a grizzled elder statesman. Even as he goes down this crazy road of being charged with murder, he doesn’t sway from his own ‘legacy’ and never budges from his core. The rest of the cast are a mix bag of familiar with some unknowns. You can reference the IMDB page if you want to see a complete list. Some noticeable names in the secondary cast is Billy Bob Thorton as the Prosecution Lawyer Dwight Dickham and Vera Farmiga as Hank’s former lover Samantha Powell. I mention these two as they represent two sides of the film’s secondary characters. Billy Bob shows the films ‘purposeful’ characters, one that makes a point and does enough to help the story. His acting is welcoming, as he does enough to provide elements of importance, but more on the courtside. Vera Farmiga is great in her role as the long lost lover, but (like some other secondary character) are unnecessarily thrust to add more stories when it isn’t needed. You have many characters that play to one side or the other like this, which fragments the storytelling. First act: Here we have the basic introduction to the two main characters. You get introduced to there ‘history’ and what makes them completely opposites people (within the same family). As the ‘catalyst’ that brings them together (Mother’s death and Murder trial), you get to see themes of family, redemption and meaning of life get introduced. The drama is slow built, but it is also littered (at times unexpectedly) comedic moments. After the intro sets all into motion, we move from a steady approach to a fragmented one. Second Act: The film starts to stretch and jump between the family and court drama in this part, dragging and pulling unwanted plot points into the fold. There is no seamless transition, causing a feeling of fragmented emotions and tone. As the family drama is heartfelt and raw, the court drama is serious and tense. You need to have a built in transition between contrasting parts; but this film fails to do so. We also get introduced to some subplots (love story, more family drama) that are pretty much not needed. If you completely removed these subplots from the film, it would have been a more focused film. Third Act: When we get the final act, we are witness to the final confrontation of the main two characters within the family and court spectrum that had been building throughout the film. As all begins to unfold, it causes some riveting performance and dramatically unexpected results. Showing unpredictability warrants a welcome ending, a fact that shows you can be opposite of the traditional ‘happily’ endings and still end on a high note. The visuals of the film are commonplace (as we get to see a farm town from Indiana). That simple touch helps bring out the story and acting; allowing everything else to dictate the mood in a good way. The score has minimal impact, and doesn’t help or hinder the film. 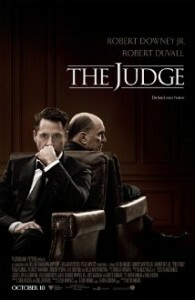 The Judge is a film with a lot of strong aspects, but also as many flaws. Even though it isn’t amazing, it is enjoyable and has its own strengths to play on. If you’re a fan of the actors and want to see a good family/court drama, this is one for you. Check it out, you will be pleasantly surprised. Dracula Untold – 2/5 – Movie Reviews by Ry!